The more thorough your preparation, the more effective your wide format digital print project will be, so the execution of any wild format project must be carefully planned. Consider everything about it - from how you want to express your ideas and the response you want, through to production, installation and removal. What happens to your ideas on a step-by-step basis is what workflow is all about. The term gets bandied about in the graphics industry as if everyone knows and understands what it means. But the truth is that it means different things to different people, and although individuals may have similar ideas of what workflow is, those ideas aren’t necessarily the same. A designer sees workflow as a series of tasks that take an original idea, say a sketch or rough Illustrator outline, to something the client can consider. On the other hand, a prepress workflow refers to the tasks - such as preflight checking and colour management - that make sure that what is sent for output is accurate and correctly formatted for the destination imaging system. A press manager will consider how to set up the printing system to produce the most jobs efficiently, for instance with minimal changes of substrate. The graphics industry has huge experience in managing digital workflows across all manner of applications from labels and packaging to newspapers. This experience comes from a long history in producing printing formes for conventional presses as well as digital print systems. Companies such as Agfa, Kodak and Fujifilm still produce printing plates for conventional presses, but they are also masters of highly-developed workflow systems for commercial print. Agfa has offered workflow management tools for many years. Agfa Apogee for the commercial sector was the first workflow system based on PDF. Agfa Asanti, which is based on Apogee, is the leading production management workflow system for wide format digital output. At Athena Graphics in Belgium, managing director Ignace Cosaert, says “customers want to lower costs, decrease time-to-market and reduce the number of mistakes. The same goes for us, of course. Perhaps the most important thing to understand about workflow is that it is fluid, which is great because it lets you keep your options open. The bad news is that fluidity can sometimes make your particular workflow vulnerable to error. This is why companies such as HP and EFI have invested so much to establish strong partnerships with other developers, large and small. Agfa and other traditional graphics technology developers such as Fujifilm and Esko also work closely with a range of development partners. EFI is a graphics market leader for wide format printers and inks, digital print servers and print management technologies. EFI’s Enhanced Hybrid Workflows are an integration of Agfa’s Apogee 10 with EFI Fiery Digital Front Ends (DFE). HP also offer a large library of options, so if you plan to print your work on an HP wide format device then use the HP SmartStream suite. The SmartStream Designer plug-in for Adobe Indesign, for instance helps with such things as image positioning and variable data placement. Esko, the partner of choice for the likes of Agfa, EFI and HP has brought its packaging expertise to the graphics industry. The company has a long history in enhancing standard tools to improve graphics production processes. The best known of these is probably the DeskPack plug-ins for Adobe Illustrator and Adobe Photoshop. They turn basic desktop software into powerful design and prepress production tools. Several years ago we all got quite over-excited about the potential of the Job Definition Format (JDF) which was intended to simplify and improve workflow efficiency forever. The idea was to use XML and metadata to inform downstream processes in the workflow. Sadly, although there are many examples of JDF enhanced workflows, the majority of the graphics industry has been underwhelmed, particularly in the wide format sector. But the work done on JDF has not been in vain. After many years of effort, a cooperation has been established between the JDF camp and the International Standards Organisation (ISO). At its most recent meeting, the ISO technical committee responsible for graphics technology formed a new task force to create a new standard to assist workflow management. The purpose of this work is to make it easier for designers and creators of print media projects to describe what they expect their final printed piece to actually look like. It sounds too good to be true, but the ISO team is confident that they can use PDF combined with metadata as the foundation. This is exciting work because it could very well remove most if not all of the uncertainty in communications between those inventing graphics projects and the people who actually do the production. The new ISO standard will define common document metadata that users can add to their PDFs. It’s early days yet, but the goal is to specify the metadata that helps content creators to get the results they want. A DFE will be able interpret that metadata and ideally check that production data match the expectation. If they do not, the exchanged content can be corrected. This work is being led by Martin Baily, chief technical officer of Global Graphics, the leading PDF developer with support from Adobe, PDF’s original inventor. The work builds on the principles of the JDF specification and draws on the expertise of various industry groups working to improve PDF-based workflow management in Europe and the USA. Having a robust and inclusive ISO standard will bring together these efforts and should provide a tremendous boost to workflow efficiency. 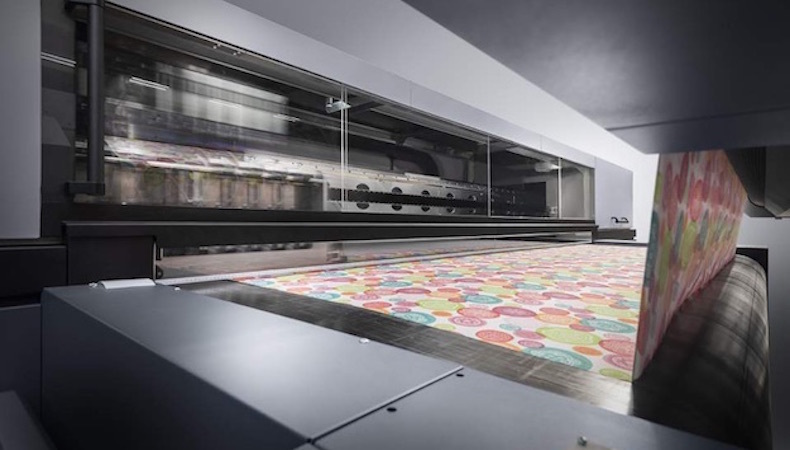 The HP Latex 3500 has an output format of up to 3.2m wide and prints at up to 180m2 per hour. Getting your data wrong or being confused about what colours you will get, can lead to some expensive disappointments. But in order to add metadata to your files, you need to understand what will happen to your job once you are ready to turn it over for a print production. When you create the PDF, don’t just assume that the Acrobat settings from your last job are suitable for the current one, even if the jobs seem similar. And keep in mind that tools that create PDFs will usually revert to the last set of selected PDF settings. As for settings, you can usually trust Acrobat’s presets. Adobe has worked hard to make sure that the presets create good PDFs, tuned to meet the demands of the output path. If you prefer, you can create your own but still make sure to check that you have selected the right one when you create the new PDF. This is especially important for output in wide formats because – clearly - the cost of errors is so much higher than for small format work. If you have limited experience in PDF creation for print, ask your service provider to give you a copy of their custom .joboptions file. You can use this information so that the PDFs you give them will have the right characteristics for accurate output. The .joboptions file specifies the various settings and output resolution the printer needs to get the best output possible for your work. Workflow is about planning and working with tools that help you get the most out of your ideas and printing processes. In addition to the few examples provided here, there are many, many more examples of workflow tools. Explore what’s out there so that you turn production into a breeze, and can instead focus on your ideas and creativity.